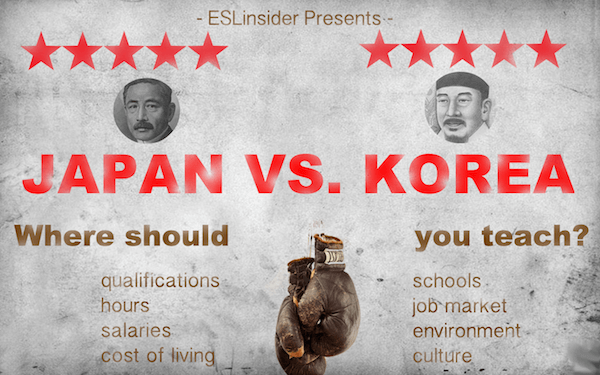 Japan vs. Korea - Where should I teach English? Japan vs. Korea? Thinking about teaching English in Japan or in South Korea? Here's a look at some of the differences between teaching in the two. The requirements to teach English in Japan and in Korea are to be a native English speaker and to have a university degree. Those are for your visa. TEFL courses are not required by law, but some schools can prefer them. You can sometimes find work on other visas, but for that you can read more on teaching English without a degree. In Korea you need to get an FBI background check and an apostilled diploma. Korea is a little more difficult to get into because of these. Both countries have relatively similar work schedules. If you teach in a private school then you will usually work from 2-9, 3-10, or 2-8pm. If you are teaching adults you may have morning/daytime hours. If you work in a public school with JET or EPIK then you will have daytime hours from about 8:30-4:30. There can be individual differences, yet there are similar kinds of schools in both Japan and Korea. Your options are mainly to teach in private schools, public schools, or in universities. Native English speaking teachers in Korea and in Japan typically work as ALT teachers in public schools. ALT stands for assistant language teacher. You will have a native Korean or Japanese teacher in the classroom with you who is the lead teacher. The EPIK program is popular in Korea for placing teachers in public schools. The JET program is a popular program in Japan that also places teachers in public schools. Interac is a private company that does the same. Private schools are referred to as hagwons in Korea and eikaiwa in Japan. They are similar. They both primarily offer after school classes to students. To teach in a university in Japan you will usually need to have a master's degree. In Korea you may also need a master's degree, yet I have met teachers who have taught without a master's degree. Extensive experience is also preferred. Japan's market is pretty competitive. To get a job in Japan from outside of Japan you would have to go through a program like Jet or through a company like: ECC, Aeon, Interac, etc. You would be better off to be in Japan to look for a job, yet there would be big start up costs for that. You can check this page out for more websites on finding a job in Japan. It would probably be easier to find a job in Korea. Korea's market is pretty good aside from the shrinking public school sector. ESLcafe is good site to look for a job in Korea. I would also recommend reading this post on how to get a good job teaching English. Where are you going to make the most money? You will probably make and save the most money teaching in Korea. Korea has a lot of nice benefits including, airfare, housing, severance pay, pension pay and a monthly salary averaging 2,100,000 Won which is close to $2000. In Japan the average salary is around 250,000 Yen a month which is a bit more on average than Korea's salary. Last I knew the JET program paid 280,000 Yen a month possibly with some benefits such as airfare and housing. Like their disclaimer says every situation is different. Benefits are generally pretty rare in Japan. Where are you going to spend the most money? Well, that depends on you. But Japan has a pretty high cost of living, so even though you might make more per month you are going to spend more in Japan on rent, utilities, food, transportation, etc. Korea's cost of living is fairly low depending of course on you and since you have free rent you'll save more. Korea is pretty mountainous with cold winters and snow in most places. If you are in Busan or in Jeju you probably won't see snow. The summers are hot and humid. Japan is also pretty mountainous with a fairly diverse environment with snow and cold in the northern parts. It's a little warmer from Kyushu on down to tropical Okinawa. Pollution is a problem in Asia. Japan is cleaner than Korea. The public is more aware and bus drivers will turn off their buses at stop lights. Korea is cleaner than China and Taiwan. I think Koreans tend to speak a bit more English than Japanese. But wherever you go it is a good idea to learn the language as it will make your life outside the classroom. There is more diversity in Japan as far as fashion, music, art, and architecture goes. It's more westernized and has been for a longer period of time. You'll see more diversity of fashion styles there, international musicians and artists go there, and the architecture generally looks better than Korea's. Neither one is America though, so you can still experience culture shock if you are an American or not. How are the people different? From what I have gathered from others is that the Japanese tend to be more reserved and the Koreans a bit more emotional and expressive. But Korea and Japan are really not that different. Which will you like better? I don't know, but I like Japan a lot better. Korea is a bit on the drab side for me. But if you are thinking of teaching English in Asia then Japan or Korea could be for you. So do your research and you may also enjoy checking out Where should I teach? China, Korea, Taiwan or Japan? or this video on Youtube about whether Japan or Korea is better. If you are at the stage of picking a place to teach one of the following stages will be the actual teaching. You don't usually need a TEFL course to legally teach in one of these places, but if you want to feel more confident in the classroom and enjoy it more then you might want to consider it. Here are some things that you will get when you log in to ESlinsider's course. And a whole lot more about the actual teaching. How confident are you with your teaching? Yes, I want to learn more about teaching in Korea and Japan.